Researchers have been able to trace the impact of volcanic eruptions on the climate over a 1200 year period by assessing ancient Irish texts. The international team compared entries in these medieval annals with ice core data indicating volcanic eruptions. Of 38 volcanic events, 37 were associated with directly observed cold weather extremes recorded in the chronicles. The report is published in the journal Environmental Research Letters. In the dim light of the Dark Ages, the Irish literary tradition stands out like a beacon. 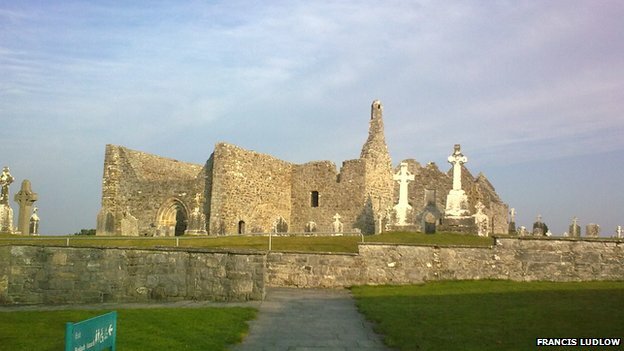 At monastic centres across the island, scribes recorded significant events such as feast days, obituaries and descriptions of extreme cold and heat. These chronicles are generally known as the Irish Annals and in this report, scientists and historians have looked at 40,000 entries in the texts dating from AD431 to 1649. The researchers also looked at the Greenland Ice Sheet Project(GISP2) ice-core data. When volcanoes erupt, they produce sulphate aerosol particles which down the centuries have been deposited on and frozen in ice sheets, leaving an extremely accurate temporal record of the event. Scientists say these particles reflect incoming sunlight and can cause a temporary cooling of the Earth's surface. In a country with a mild maritime climate like Ireland, these colder events would have a significant impact. The Hekla volcano in Iceland had a major eruption in AD1104. This clearly registers in significantly elevated sulphate levels in the Greenland ice at the time, and is reported in the Annals of Inisfallen as: "Heavy snow this year, and a great loss of cows, sheep and pigs in the same year." And then again in AD1107, it is reported that "Snow fell for a day and a night on the Wednesday before the feast of St Patrick, and inflicted slaughter on beasts in Ireland." "When the weather that is cold enough to allow you to walk over a lake in Ireland, it is pretty unusual," lead author Dr Francis Ludlow, from Harvard University, told BBC News. "When it happened, it was remarkable enough to be recorded pretty consistently." 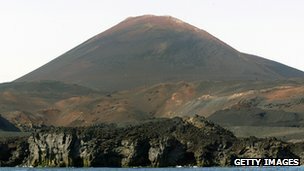 The scientists in the team identified 48 volcanic eruptions in the time period spanning 1,219 years. Of these, 38 were associated closely in time with extreme weather events identified in the Irish texts. "These eruptions occur and they override existing climate patterns for a period of two or three years," said Dr Ludlow. "And it is clear from the sources that they cause a lot of devastation among societies at the time - whether it was the mass mortality of domestic animals or humans, or indirectly by causing harvest failure." The research team believe the texts are accurate as the annals also record solar and lunar eclipses which can be compared with other contemporary sources. The keen recording of weather though had another motivation. "A lot of these scribes are working in monasteries, in some time periods they are interpreting these weather events as divine omens or portents as signals of the coming of the last days," said Dr Ludlow. "That was one of their motivations so we are able to use the records that were created for a completely different purpose that the scribes would never have conceived." The researchers say that one expected effect of volcanic eruptions that occur in tropical regions is to make for milder winters in northern latitudes. But in this study, they found several instances of these type of eruptions causing extremely cold winters in Ireland. The team believes their work shows the complex nature of volcanic impacts on climate, and they say there are lessons for the future in the ancient texts. "That tells us a lot about what sort of weather we might expect in the British Isles when the next big eruption goes off," said Dr Ludlow. "We might want to buy a bit more salt for the roads."